Beware of working with renders and treated wood. The use of timber cladding and elaborate wood detailing in new builds and refurbs seems to be on the increase in a big way. When wood is skillfully used in a contemporary design along with a great looking render such as those by K Rend or Parex the results can be stunning. Unfortunately, in a lot of cases this stunning look may only be temporary as one key problem seems to be getting overlooked time and time again if the regular calls our Mendrend technical team receive are any indication. 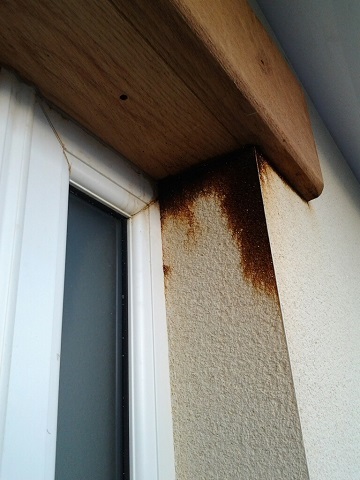 A lot of the pressure treated timber on the market appears to be treated with a substance that is not completely water proof so when the timber gets wet the wood stain is then dragged down the wall which then pentetrates deep into any surface that is porous such as your normal cementitious render. The results can be devasting and extremely difficult to correct. We strongly advise if you are considering the use of treated wood in the design of you build that you check with your wood supplier that the treaments used in its production are completely stable in the presence of water or consider the use of an additional wood seal that makes the timber completely impervious to water. Please call our technical team if you need any advice with the rectification of this issue.